Workforce development has become more than a topic of discussion among contractors; it’s now a mantra. Everyone is looking for skilled labor and not finding it,” Northwest College of Construction; President Bob Strader said. But nonprofit Portland Opportunities Industrialization Center (POIC) Inc.and Rosemary Anderson High School have partnered to make a difference in the situation. They are offering a pre-apprenticeship course to young people ages 17-25, most of whom are minorities and come from disadvantaged backgrounds. 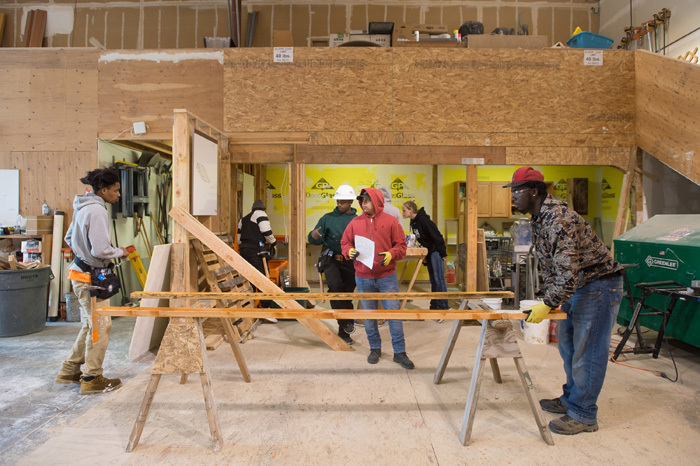 Work Opportunity Training classes kicked off at the Northwest College of Construction in Northeast Portland a month ago, and the 12-week program will conclude June 21. At that point, graduates will be able to start work or continue their training in a formal apprenticeship program. And even though the program is just starting, contractors from throughout the Portland-metro area already are expressing interest in connecting with these first 10 students, according to Torre Sathrum, a POIC instructor. For 26-year-old Benson Polytechnic High School graduate and program participant Trayvayae Cason, there is little time to waste. Cason said many of the men in his extended family have taken jobs in skilled trades. And at Benson, known for its construction course and other vocational programs, he developed an interest in trades that survived having two children and a stint in California before a return to the Northwest. The POIC is an affiliate of the national Opportunities Industrialization Center of America, which was founded in 1958 in Philadelphia to help young black men and women obtain employment training and work opportunities. The Portland affiliate was established for the same purpose a decade later, and currently serves more than 700 students and work trainees each year. Three programs are offered to young adults (up to age 25) in Portland: Rosemary Anderson High School, for those in need of a diploma; POIC Work Opportunity Training, for those in need of career training; and Rosemary Anderson Transitions, for graduates in post-secondary education in need of mentorship and support. In addition to the new pre-apprentice program, the POIC also offers family services, young parent education, street-level gang outreach and other initiatives geared to help people in poverty. For a while we have wanted to train youth for a specific career path,” McClintock said. “There’s such a need in Portland to fill these construction jobs, and especially with young people of color and women, that’s really where this came from. The wages and opportunities are so great in the trades and construction, it’s really a pathway out of poverty. On a recent Monday, the 10 students enrolled in the program filed back into their college classrooms after an early-morning visit to a new POIC space. Remodeling is under way in the former home of a Gresham Police gang outreach office at the corner of Southeast 187th Avenue and Stark Street. Located in the heart of Rockwood, in east Multnomah County, the new space will give the POIC a seat in the Rockwood Rising development poised to rise soon. It’s a central location that likely will attract additional job seekers. But for now, it’s a first glimpse for the 10 students at what construction is like in the real world. Sathrum said students, who must pass an application process, must be at work or in the classroom by 6:30 a.m. each morning. Attendance is compulsory, just like an employer would demand. And students are expected to adhere to industry safety standards and regulations while they work. Each student gets a paycheck during the entirety of the 12-week course, along with the skills needed to step into an apprenticeship either via another training course or with a company looking to fill a labor gap. It’s like a real job for them,” Sathrum said. Sathrum knows full well the value of pre-apprentice and apprentice programs like those offered at the Northwest College of Construction. He’s worked as a general contractor as well as an instructor. And in the latter role, he said, he has often seen students quickly succeed in the construction after completing their training. There is an increasing emphasis on getting minorities and women into apprenticeship programs and jobs in the field, in part because of increasingly rigorous public project workforce requirements. For instance, subcontractors working on the ongoing Multnomah County Courthouse project are required to employ at least 20 percent minorities and 6 percent women on the job. And that’s among the journeymen working; for apprentices, the numbers are even more aggressive: at least 20 percent minorities and 25 percent women, said Justin Paterson, a project manager with Hoffman Construction. Strader agreed, saying construction in the public sector is what is driving students to the Northwest College of Construction. Some contractors working entirely in the private sector still send students to training schools like the PNCC. But that represents a “small minority” of the industry, Strader said. Money for POIC’s pre-apprentice program comes from Worksystems, a Portland nonprofit that focuses on workforce development. Worksystems receives money from local, state and federal governments and distributes it to workforce development programs around the region. Further, Metro and Mortenson Construction have chipped in to help develop the program so that it would be able to complete the Bureau of Labor and Industries pre-apprenticeship program certification process. This has allowed POIC students like 23-year-old Jennifer Geisler, who commutes daily from Kelso, Washington, a chance to achieve something meaningful. Unlike her twin sister, Geisler added, she had to navigate through a number of life obstacles before finding herself responding earlier this year to an online ad for the POIC program. When it comes to providing entry-level training for people looking to step into careers in the construction trades, Monte Boyer knows there’s no substitute for real-world experience. 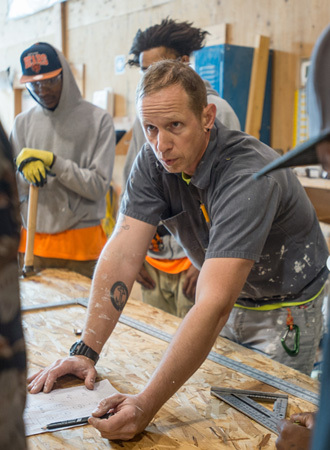 That’s why Boyer, the manager of craft instruction at the Northwest College of Construction, has made it a habit to try to find projects for the school’s students that provide hands-on experience while giving back to the community. The most recent of those efforts is under way at Pleasant Valley Elementary School in Gresham, where the construction college’s students are building a boardwalk and trail system so that students from the grade school and people from the community can easily access a 10-acre site called Wildside. Since 2007, Pleasant Valley science teacher David Scharfenberg has been working with his sixth-grade students to turn the field from a tangle of blackberry brambles and weeds into a place that is equal parts outdoor laboratory and forest restoration project. At least twice a week, students leave the classroom and head out into Wildside to conduct experiments. Scharfenberg and his students have planted 4,200 trees and conducted studies to monitor their health. They’ve studied, identified and removed invasive species and worked to re-establish native plants in the area. The work to transform the site has offered other lessons outside the world of science. With a limited budget to improve Wildside, Scharfenberg’s students have learned to write grants. Those efforts have resulted in drumming up about $225,000 from agencies that include Metro, the Oregon Watershed Enhancement Board and the Multnomah Soil and Water Conservation District. They’ve also learned about the intricacies of developing and building in sensitive natural areas as they’ve started to use some of the grant money to install a boardwalk and trail system that will allow others to visit – and learn – about Wildside. In order to stretch the grant money they received for the boardwalk project, Scharfenberg and his students had to get creative. Working with a Tualatin-based company called Western Wood Structures, they found a basic design and a pin-pile foundation product called Diamond Pier that minimized the amount of concrete that would have to be poured to create a foundation for the boardwalk. The teacher and his students also needed to minimize the cost to actually build the boardwalk and trail system. Scharfenberg had been in talks with ACE Academy to have students in the school build the boardwalk. But the school ended up closing before the projects reached the construction phase. A plan to work with pre-apprentices from Oregon Tradeswomen Inc. also fell through because the school was too far outside of OTI’s coverage area. Then Scharfenberg remembered the building he’d passed by near Northeast 82nd Avenue more than once – the Northwest College of Construction. He figured someone there might be able to point him to a new resource. He contacted the college, and soon he and Boyer were discussing how the school and the college could work together on the boardwalk project. 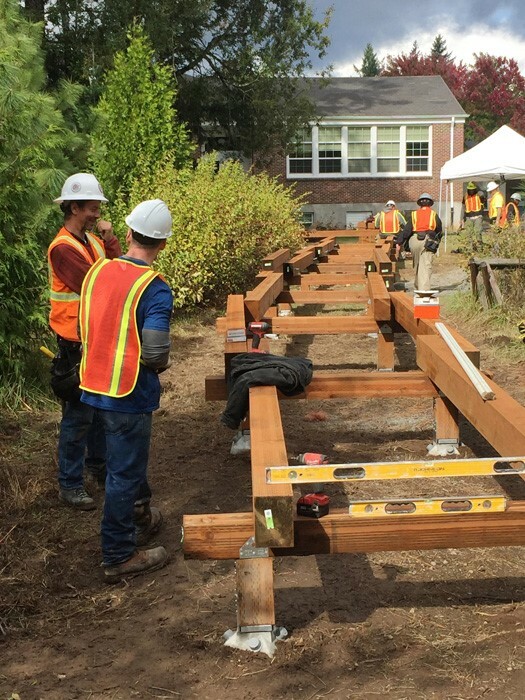 The students at the construction college first began gaining field experience through community projects about 10 years ago when an instructor at the school told Boyer that volunteer help was needed to build the Heroes Memorial in Gresham. For Boyer, the project provided a solution to the challenge of evaluating how students would perform on a real project while providing them with hands-on experience to support their classroom learning. 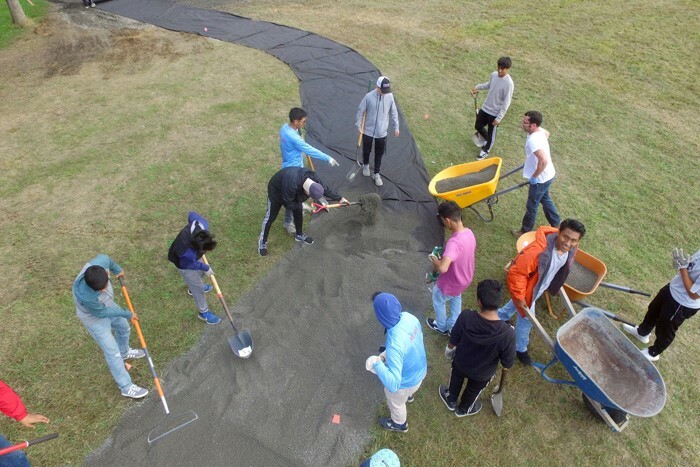 Soon after the construction college’s students wrapped up a year of working on the Heroes Memorial, more community project opportunities came their way. Although the flood of community projects dried up during the recession, it resumed about four or five years ago, Boyer said. The Pleasant Valley boardwalk project is more than just a basic hands-on experience, though. It also is providing students exposure to new techniques as a result of working with the Diamond Pier system, which Boyer said he had never worked with until now. The project also has offered an opportunity for the college to begin to forge a new partnership with Portland Youth Builders and Constructing Hope, which also are providing pre-apprenticeship students for the work crew. “It’s just opened up a whole new avenue of opportunity,” Boyer said. The boardwalk project, which includes construction of between 1,000 and 1,200 square feet of gravel trail, is approximately one-third of the way toward completion. Work is expected to wrap up by the time the school cuts a ribbon to celebrate the 10-year anniversary of Wildside. In the meantime, Scharfenberg’s students are already busy on their next project. Northwest College of Construction students attend their graduation ceremony in a boom time. PAMPLIN MEDIA GROUP: ADAM WICKHAM – James Phillips, his wife Maryann and son Noah, at Jamess graduation ceremony. While working for Gregory Pacific, Phillips has done mainly footings and pipe laying. He expects his basic wage to go from $16 an hour to $20.66, the BOLI mandated minimum for qualified laborers. The labor shortage in construction means it’s a good time to get in on the ground floor. 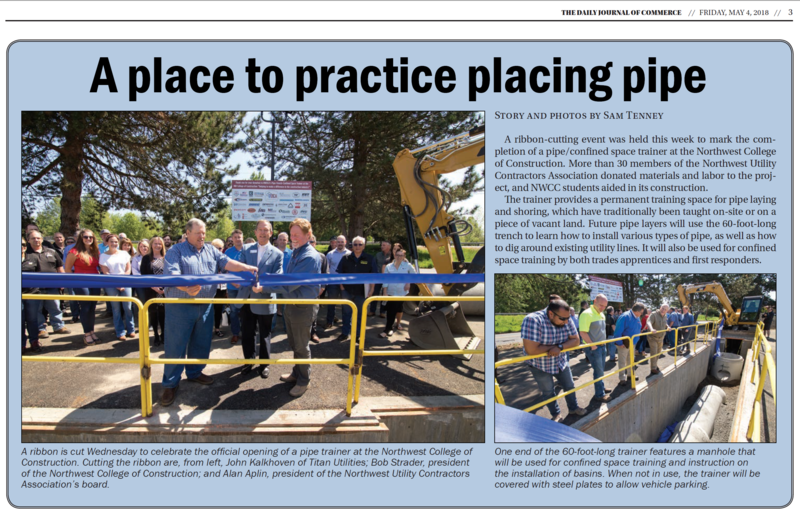 That was the thinking of several worker-students at the Northwest College of Construction’s recent graduation celebration. The Class of 2017 gathered at the Embassy Suites near Portland International Airport to mark their commencement. 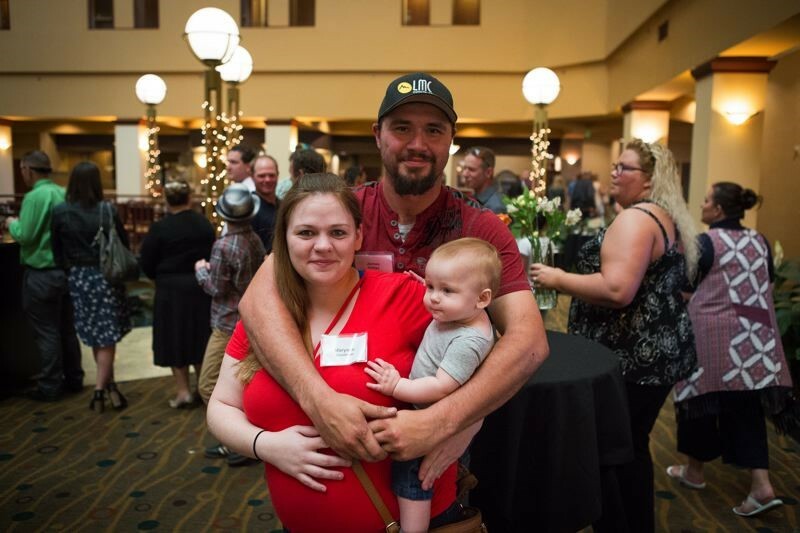 Students including sheet metalworkers, carpenters, heavy equipment operators, masons, tilers and laborers, who brought their families for dinner and to see them walk the stage. Most students enter the college with some sort of experience: they’ve helped family members with building jobs, or they have worked in construction and want to specialize. Last October the Business Tribune looked at a class of Oregon-Columbia Laborers (Going into labor, Oct. 28, 2016). Their instructor was Cory Fisher, who had been a laborer and progressed to his current day job as a welder in construction. Fisher had six students in his laborers class. Three made it to graduation. One guy, he said, went back to his old job. Another went to work for a union. Another, Andy Sorrick of Mill City Oregon, an outspoken young man with a military background, left to be a gunsmith. 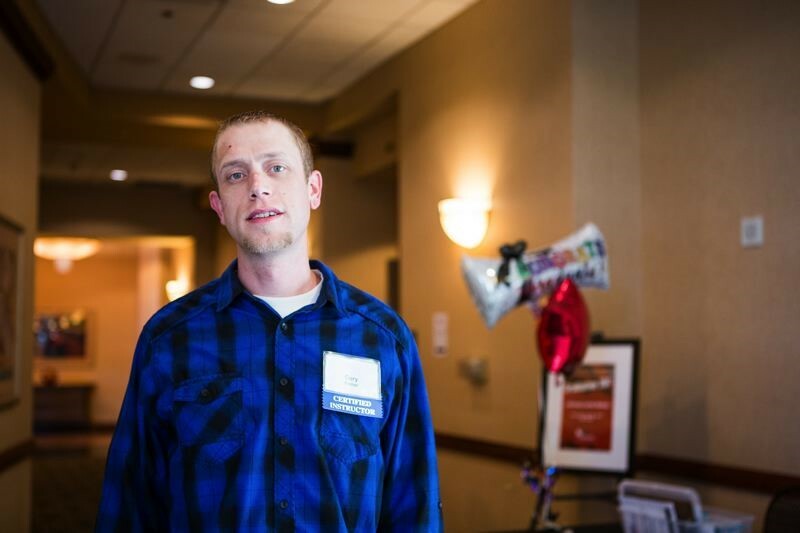 PAMPLIN MEDIA GROUP: ADAM WICKHAM – Northwest College of Construction instructor Cory Fisher is a welder by day but teaches laboring to long distance learners. He says employers are loyal to graduates to who are loyal to them. Laborer Graduate of the Year Jonathan Anaya credits the school with encouraging employers give him more opportunity and better pay. Katrina Cloud, NWCC Director of Apprenticeship, introduced the graduates and speakers NWCC President Bob Strader and Brad Avakian, the Commissioner of the Oregon Bureau of Labor and Industries. In the hot May sunset, Fisher was working the phone the evening of May 25, 2017. Of the nine graduates listed in the laborers section, only two had come for the ceremony. That’s not surprising since they are mostly long-distance learners: they work full time and often live outside Portland. Typically, they cram their study time at the college into a Friday night and Saturday, and do their homework at home — after work. Fisher was worried because Graduate of the Year, Jonathan Anaya, hadn’t shown up. The pre-func drinks around the fountain were over. The dining room was crowded and the servers were starting to move amongst them, filling wine glasses and setting down plates. Fisher dialed and texted for a while until he finally got a hold of Anaya. Twenty minutes later, the slight 27-year-old hurried in wearing a clean shirt and smiling. At five o’clock he had gotten off work in Vancouver, where he is laying pipe in a subdivision. Then he had to fetch a rental car and go home and pack for a family trip to Manteca, 17 miles from Stockton, California. He was planning to drive straight through the evening but put it off until nighttime at his teacher’s request. Why does he think he made graduate of the year? 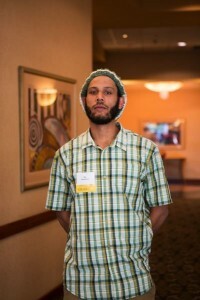 PAMPLIN MEDIA GROUP: ADAM WICKHAM – Cy Robertson, a cousin of Jarvis Zirkle, is also a carpenter, and has worked on many Portland area projects. His friend in Reno is making $2,000 a week, which is tempting, but he doesnt wan to leave his family behind in Portland for work. In his job with excavator firm Tapani Underground of Battleground, Washington, Anaya has worked his way up from helper to top hand, (the person on the top of the ditch) to pipe layer (the person in the trench). He has handled pipe from 10 inches in diameter to 18 inches, although they get as big as 24 inches. They work on sewer, water and storm water in the growing Vancouver suburbs. An excavator lowers the pipe into place, but the pipe layer is down in the trench placing and connecting it. He says he has seen small accidents, nothing serious. But it’s a dangerous trade. Anaya likes pipe laying but he wants to work for a couple more years then return to the same school for the HVAC certificate. 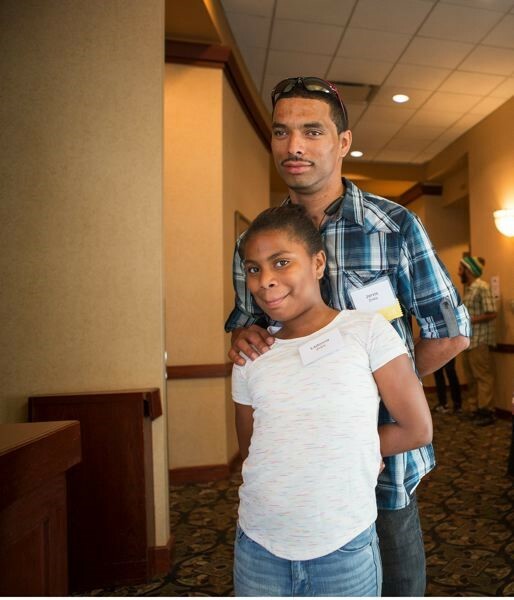 PAMPLIN MEDIA GROUP: ADAM WICKHAM – Jarvis Zirkle and his daughter Ladonna. Zirkle is a carpenter, and says there is plenty of work right now in Portland. Reece Stone, Wyatt Fowler and Andrew Sorrick: The three from Fisher’s class who graduated are still working for the same companies after two years. He says as properly trained laborers they can now move up the ladder. They could be leading crews of heavy machinery operators, other laborers or carpenters. 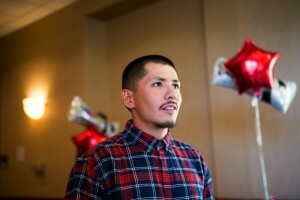 PAMPLIN MEDIA GROUP: ADAM WICKHAM – Laborer Graduate of the Year Jonathan Anaya credits the school with encouraging employers give him more opportunity and better pay. And the pay does go up. Another graduate from the Laborer group, James Phillips, was there with his wife Maryann and son Noah. Phillips has worked for Gregory Pacific for a year. They are based out of Lake Oswego but they do excavation for civil and commercial projects all over Portland, Southwest Washington and even as far as Eugene. “We generally do footings and pipe laying,” says Phillips. “We did all the footings for 12th and Market,” an apartment building in progress downtown a few blocks from the Portland Art Museum. His firm dug the dirt and laid down everything under the concrete. He’s psyched to be a laborer. Currently he earns $16 an hour, but he says the last letter he got from BOLI said that his minimum wage as a qualified laborer will go up to $20.66 an hour. Does he have any advice for prospective students? 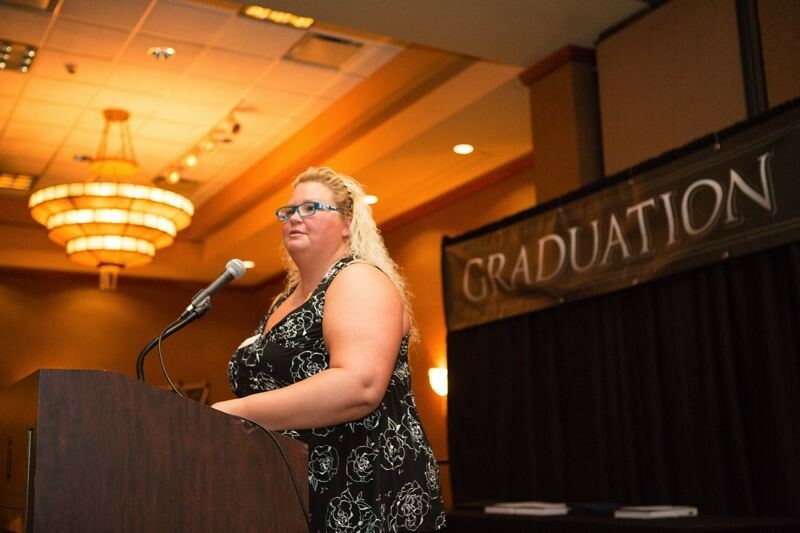 PAMPLIN MEDIA GROUP: ADAM WICKHAM – Katrina Cloud, NWCC Director of Apprenticeship, introduced the graduates and speakers NWCC President Bob Strader and Brad Avakian, the Commissioner of the Oregon Bureau of Labor and Industries. In his address to the guests, NWCC President Bob Strader borrowed a theme from a TED Talk and reminded the students that they have grit. Cy Robertson and Jarvis Zirkle were shining examples of the friends and family nature of NWCC’s intake. They are cousins and came to celebrate with their kids and extended family. Robertson was in the carpentry finish program. He was pretty excited to be close to graduating, needing just a few more hours. The course takes four years, with 8,000 hours required of on the job training, and 144 hours per year of bookwork. He now works for LG Contractors, but has worked for R&H and Primo. “I’ve been bouncing around. The longest is three years straight with the different companies. I wanted to get different experience,” he said. Robertson describes his work as going from bare ground to a completed building, such as an office or hotel. The investment boom has sent steady work his way. He worked on a New Seasons in Woodstock from start to finish, and on another one in Tualatin. He has done roofing, wood framing, metal framing, welded some flowerpots, and done the finishing of walls and floors and installed door hardware. The card (his graduation certificate) would help him join the carpenters union. Would he head to Reno? He works for Wood Mechanics, a framing outfit. If you see a concrete base, stick-built apartment building going up around Portland right now, that’s the sort of job he’s on. He was there with his daughter, Ladonna. Graduate of the Year Jonathan Anaya made a point of adding to his interview. He was pleased with the college. “Put in the paper that this is a great school and it really changed my life,” he said. Brad Avakian, the commissioner of the Oregon Bureau of Labor and Industries, gave the commencement address. He was introduced as having degrees in psychology and law and as having worked as a civil rights and labor attorney. He came clean about coming from a trade family but never having been a blue-collar worker himself. He told the story of his grandfather who came from Armenia as a tile setter and retrained as a carpenter. That man had seven sons who were all electricians and carpenters. Avakian remembered riding though the streets of Fresno and his dad telling him that the neighborhood was built by his grandfather and uncle. He went on to plug his initiative to return shop class to Oregon middle and high schools — and he meant 21st-century shop class. In Beaverton they study biomedicine, and students in Bend design (using CAD) an electric car, fabricate the sheet metal body, install the motor and braking systems and, finally, race their electric cars on the local track.